Communication in human dialogue is based on one another's words and body language. We can sense whether the other person is distracted, and we change the course of our conversation and our actions to regain their attention. Most existing robots, however, still use monologue mechanisms, even when engaging in dialogue with a person. For example, they continue speaking in the same way, even if the person is not paying attention. Researchers at the Interactions and Communication Design (ICD) Lab at Toyohashi University of Technology have devised the novel robotic communication approach that takes into account the listener's attention. The robot follows a person's gaze and determines if that person is distracted by, for instance, a sports event in the background or something in their surroundings. The robot bends forward and nods if the person is watching television or it turns its head and looks around if the person is looking elsewhere. These behaviors are accompanied by appropriate utterance intended to regain the person's attention. 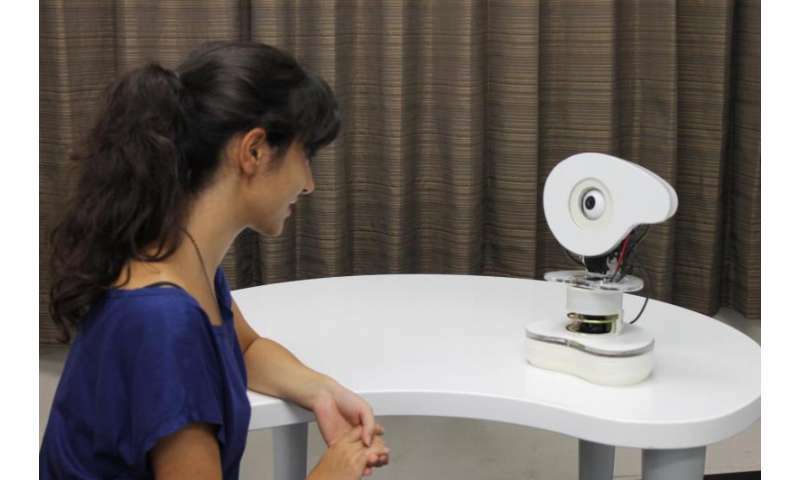 Experiments have confirmed that these adaptive interactions considerably increase the other party's attention focused toward the robot as compared with the gestures and speech generated without considering the person's gaze. "We have set up an environment to manipulate the person's attention with an engaging sports program broadcast simultaneously with the human-robot interaction. This allowed us to validate a suite of conversation situations and utterance-generation patterns," said Hitomi Matsushita, first author of the conference paper on the robot. "Talking-Ally dynamically determines and synchronizes its body language, turn initials, and entrust behaviors within the speech, according to the person's attention coordinates," Professor Michio Okada, head of the ICD Lab, explained. "Our analysis shows that this is significantly more persuasive than generating these behaviors randomly." Talking-Ally currently chooses its responsive gestures at random from a set that suitably corresponds to the person's level of attention. Future work on the project will include further customizing the robot's interaction to individuals by choosing a specific body language to use in each situation based on subtle cues from the other party. More information: Naoki Ohshima, Yusuke Ohyama, Yuki Odahara, P. Ravindra S. De Silva, and Michio Okada (2015). Talking-Ally: The Influence of Robot Utterance Generation Mechanism on Hearer Behaviors, International Journal of Social Robotics, 7(1), 51-62.